It’s easy hide yourself when you feel pain or experience something that was said or done to you – that made you feel shame. But, look at Jesus. He could have chosen to hide his most vulnerable moments when he felt torn. Instead, he gathered his closest friends with him in Gethsamane. Why would he cry and let his disciples hear his most desperate prayers? Because there is nothing shameful about our feelings of fear, feeling torn or our most honest questions and doubts. To experience healing, we need to let others in. First with God, and then with others. Healing cannot be done alone. That’s because love is a person’s presence. Presence is healing. This is the encouragement I want to share with you in today’s Lent Reflection below. If you’re following along with me reading the book Whispers of Rest, we just finished week #3 of Dreaming as the Beloved. This week, we step into Week 4: Healing as the Beloved. 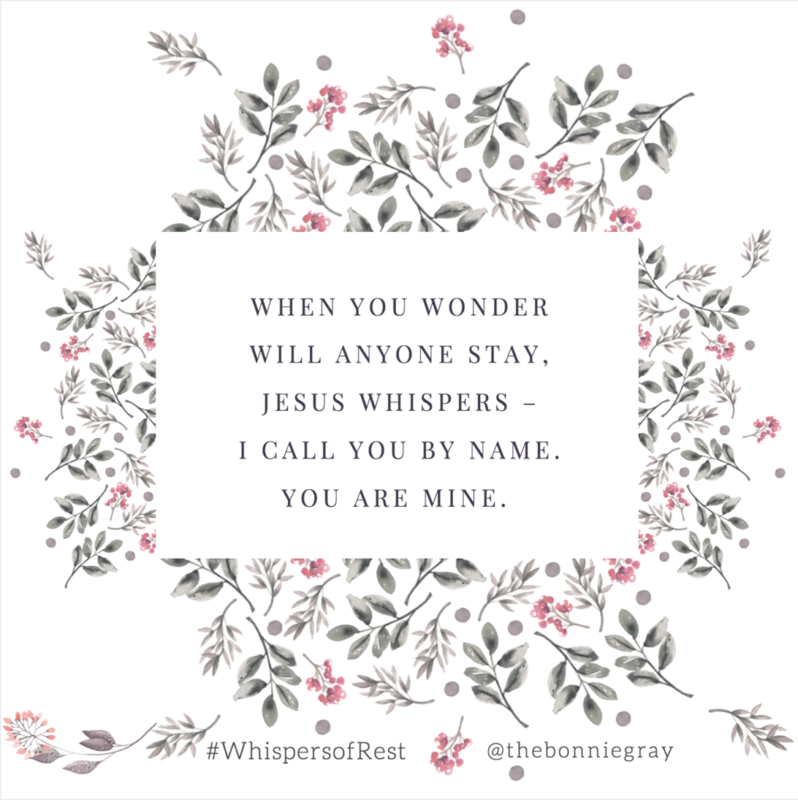 And if you ordered the extra resources in my Soul Care Package, be sure to enjoy and listen to this week’s new intimate Whispers of Rest Prayer Podcast #4: Heal as the Beloved, with beautiful music and scripture reflection. Open your heart. Let God whisper of rest touch you with His gentle Voice of love. Go to our FB Group to watch it here. Replay available. 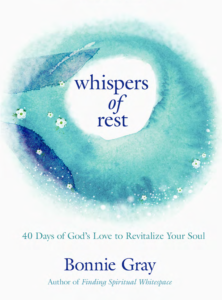 #4: Get the Whispers of Rest Soul Care Resources Package! *NEW! * I’d love to encourage you daily! 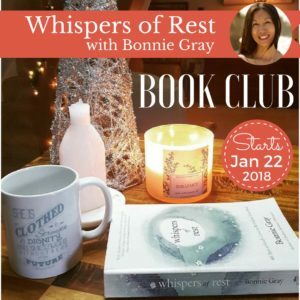 For extra resources to refresh your soul and take better care of yourself, I created this powerful DAILY companion resource to Whispers of Rest. I’m SO excited to announce it ! a beautiful NEW 40day Soul Care Guide eBook called “You’re Worth Loving”, 6 teaching videos, 6 prayer podcasts, Scripture coloring pages – and access to a Self-Paced Online Book Club! 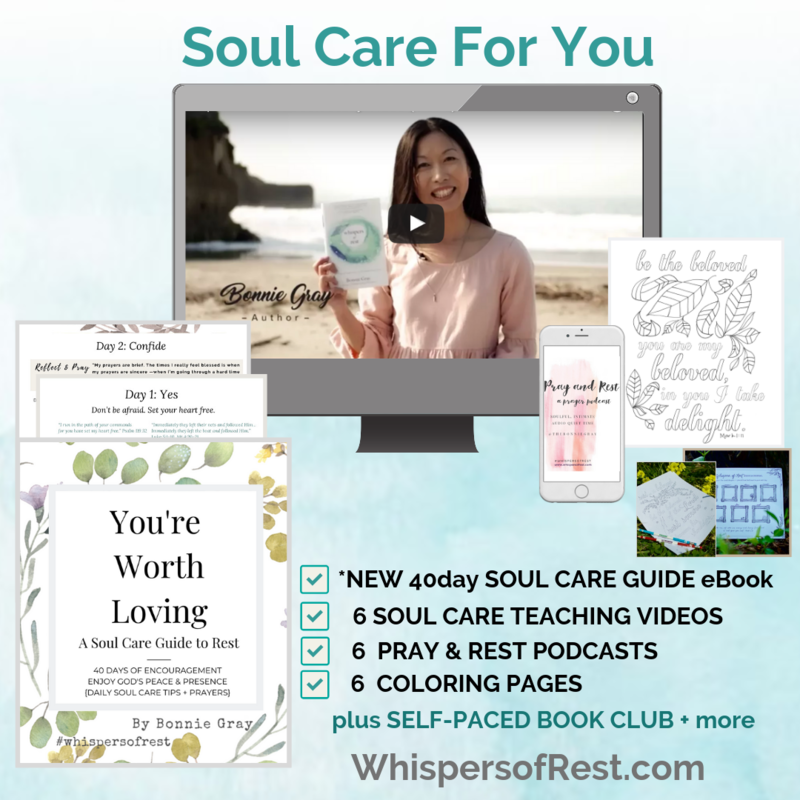 Click here to get the Whispers of Rest Soul Care Resources Package! 4. 😉Are you Following me on Instagram and Facebook Yet? 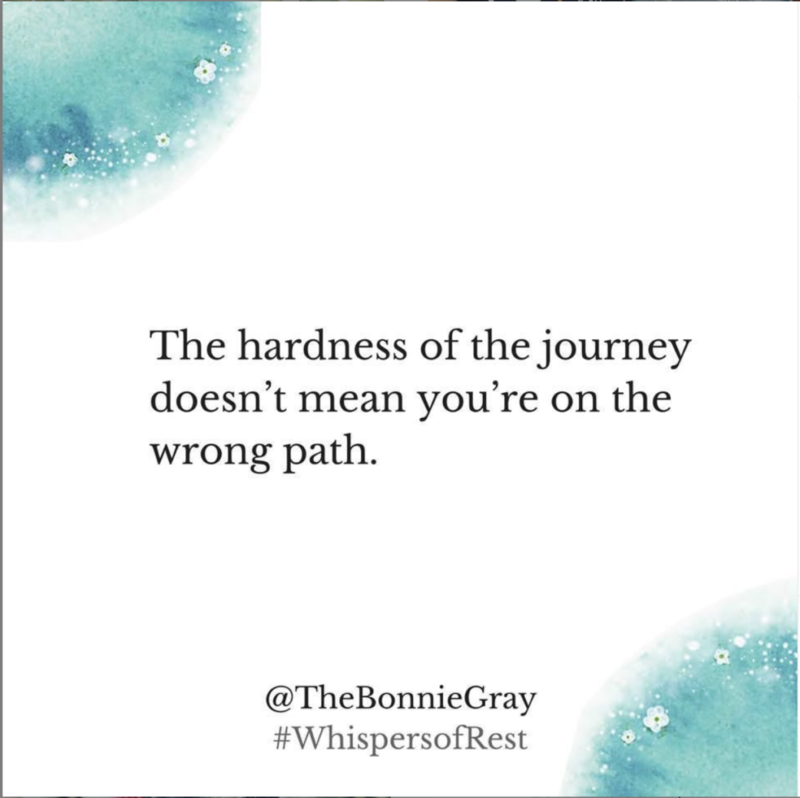 Click here to follow me on Instagram @thebonniegray right now. Click here ollow me on Facebook @thebonniegray right now! We all need someone. Hold on to me. What one word speaks to you in today’s verse? This is a beautiful, lonely, hard, and easy truth. Beautiful if you have someone. Hard for the times you’d rather not need. Easy for the times when someone you need — needs you too. You might look at me with my first book published, with a loving husband Eric and two beautiful kids Josh and Caleb. And you might think I ought to be so happy. I am. But, I also want to confide in you. 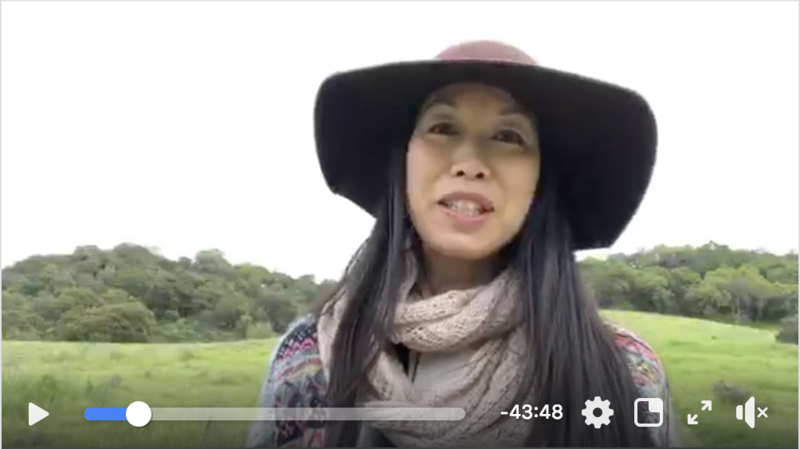 I want to tell you that the journey to really being you — the journey to really finding your voice may inevitably lead you back to parts of your story — people, experiences, conversations or situations — that you’d rather avoid. You may tempted to choose safety. To stay quiet and hide, rather than be vulnerable and real. You may have to make some hard decisions where there are no uncertain outcomes. You may have to take up a cross that’s been hard to bear. Maybe like me, in order to follow God where He wants to take you, you will need to go through uncertainty. Maybe even loss. Even though you know God is with you,and even though you know faith will get you through, you cannot avoid the hardness of the journey. Even though there is much to be thankful for you — and your heart is truly grateful for all the ways God is walking with you — you cannot deny the weight of the cross on your shoulders. 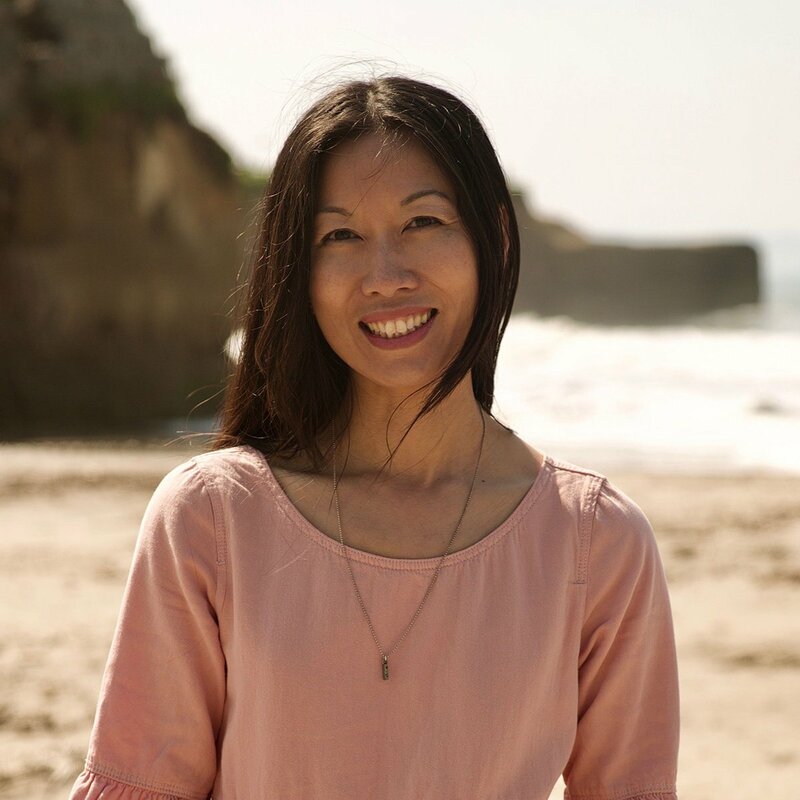 As I’ve confided in you — prior to changing my life through about soul care and drawing close to God intimately through Whispers of Rest, I always knew in my mind that God loved me. But God is inviting me to not just know I’m his beloved. God’s calling me to dare to be his beloved and experience I am his beloved. Today. To step out and make choices I have never done before. To say no, when it’s more comfortable to say yes. And to say yes today, rather than waiting to be better, stronger or more ready. It’s too hard. Who am I to think I can make this journey? After Jesus was beaten on the head by the reed the Roman soldiers put in his hand to mock him as king, after they crushed a crown of thorns into his head, and after they had flogged him with whips, Jesus was thrown out of the Praetorium. The Pretorium was the governors hall, where Pontius Pilate gave Jesus the death sentence, where the soldiers assaulted Jesus emotionally, hurling unspeakable wounding words targeted to bring shame and humiliation. It wasn’t enough to break his body. They wanted to break His heart and His spirit with their words. After this takes place in the secrecy of the Praetorium, Jesus is expected to take his first steps through the Via Dolorosa. In front of everyone. Following his beating, it’s likely Jesus could not physically carry the cross all the way to Calvary. In that moment, a man whose journey somehow crossed his path was pulled in to help him. We don’t know if Simon even knew who Jesus was. Did they even exchange any words? It’s unknown. All we know is that an ordinary person helped the Savior. Through one simple, understated act, a person became part of the journey with Jesus. It’s okay to need someone.When the cross is too heavy to carry — but we still want to be faithful to see the journey through — we should not be ashamed to need someone. It isn’t shameful to be broken—because we are still, and always, beloved. Is Jesus calling you to step forward on a journey that feels uncertain and daunting?Don’t be ashamed at the weight of that cross. Or what others might say about you. Listen to Jesus assure you that he carries your emotional wounds, so that you can be healed of all shame today. Imagine yourself with Jesus the moment He fell down under the weight of the cross and He needed someone to carry the cross. 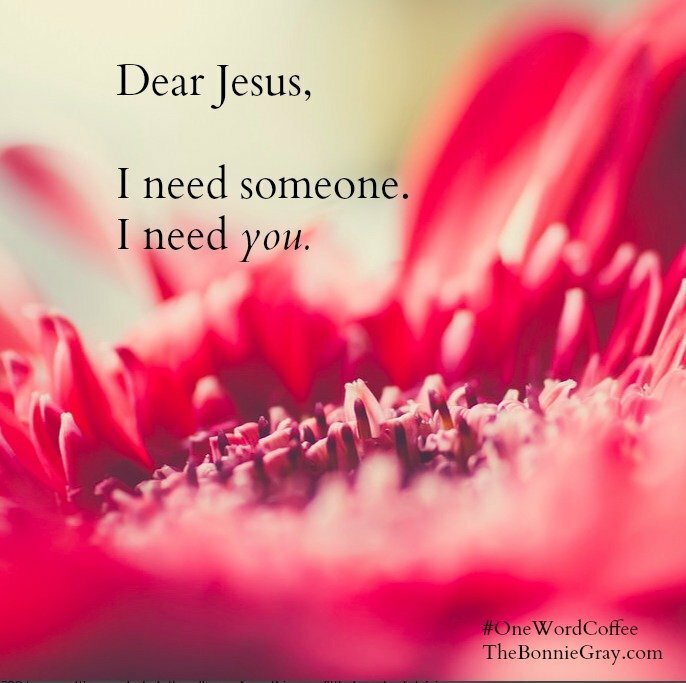 How do you feel as you see Jesus needing someone in that moment? “One look at him and people turned away. …He took the punishment, and that made us whole. Surely our grief he himself bore, and our sorrows he carried . . . Experiencing anxiety is not cause for alarm. We are headed in the right direction — following our heart with Jesus. And with others. If we went back to hiding and staying safe, we would experience no anxiety. But, think of Jesus. Imagine how His steps on the Via Dolorosa were soaked in anxiety, physically disorienting suffering, and emotional anguish against the sea of voices. Then think of Simon who walked broken road alongside him and carried the cross for him. And he doesn’t want you to journey alone either. Who are the Simons in your life? Who has carried your cross? Who has prayed for you, helped you? Who has been there for you? None of us can make it through this life alone. Even Jesus journeyed with trusted friends, many of which were killed because of their association with Him. Take a moment and think of someone who has helped you along your journey.Picture them. What they said. How they said it. What they did. how they did it. Close your eyes and think of them. As you do, thank God for them. Ask God to bless and protect them. Email today’s blog post to them and thank them. Take a moment to thank these understated people who have helped you climb the hill of life.And if you’re struggling to think of a Simon, yet longing to need one, dare to let someone know of your need. Someone safe. Let someone help you carry the burden. Let God transform your need for someone to become a beautiful truth. Thank you for walking the lonely, broken road, so I don’t have to walk alone anymore. I need someone. I need you. Heal any feelings of shame I may feel for needing someone. Transform my brokenness to become a doorway of your love to listen and be someone’s friend. Just like you. Thank you. Your love is amazing. You are my everything. I love you. Amen. You’ve made it okay for me to need someone. Give me courage to need others. To trust again. You are beautiful to me. Amen. Take a moment to be present in this moment. How is God touching you with His love today? Pull up a chair. Enjoy a cup of quiet together. Click to comment on the blog. Share. As you feel prompted. Or go here to our FB Group to share your Ah-Ha Moment. Schedule Coffee with a Friend. Talk about how you’re feeling, not just what you’re doing. Friendship heals the soul. None of us can make it through this life alone. Life is imperfect. Even Jesus journeyed with trusted friends. Be vulnerable. It’s healing to journey together. Just as Jesus named his emotions by sharing “my soul is overwhelmed with sorrow” (Matthew 26:38), we can feel better by verbalizing our negative feelings. A brain-imaging study by UCLA psychologists revealed that simply putting words to our feelings reduces the level of emotional pain we experience. Participants were asked to view images of people expressing emotions like anger and sadness. As they did, research- ers saw brain activity in the amygdala (the area that triggers stress anxiety in the nervous system) fire up like crazy. But when people simply labeled the emotions they observed, it reduced the brain’s emotional activity, restoring calm. Don’t hide your negative feelings to feel better or force yourself to move past them. Instead, talk about your feelings, and you’ll curiously feel better! you see the intimate ways she needs you. and you don’t turn away. Reassure her of your love and complete understanding. Guide her to the other side of her healing. Strengthen her with your love. to say as you did—not what I want. But what you want. so she doesn’t have to suffer alone. brokenness into beauty. Because you are there with her. In Jesus’ name, Amen. new with you this week. As she consider what you may be making new in her. but by transforming it into an intimate place of love. that you cannot share with her. you’ll heal her in that place of remembering, just as you did for me. How can you allow Jesus to love you, comfort you, or refresh you on your journey this week? 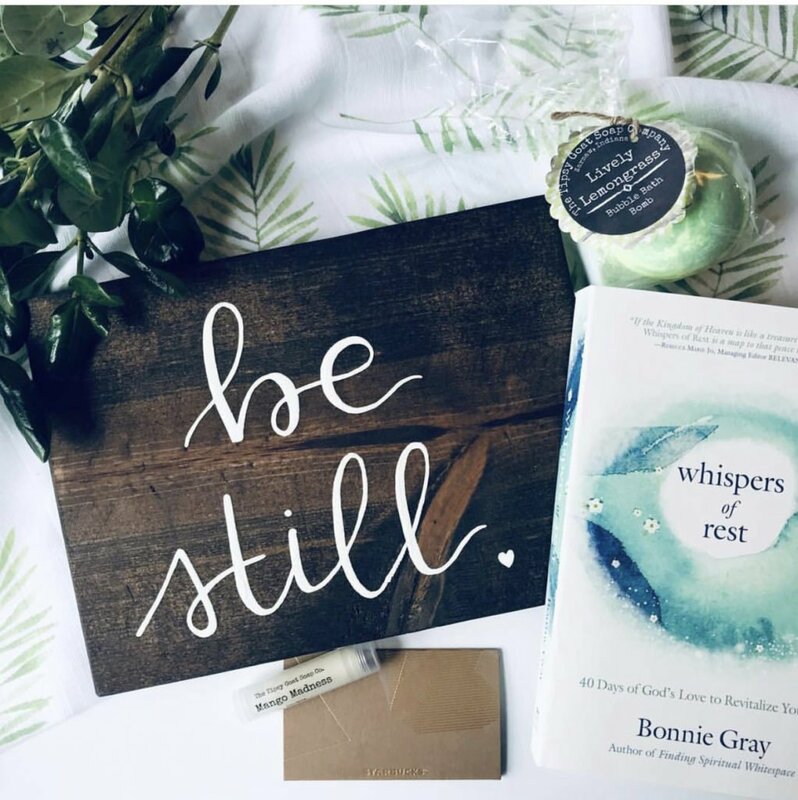 Give yourself permission to do this week’s daily soul care challenges in Whispers of Rest and take time to do practical things to return calm and refresh your soul this week, sweet friend. You’re worth it. Pull up a chair. Click to comment. This is a quiet place to rest awhile. And stay. 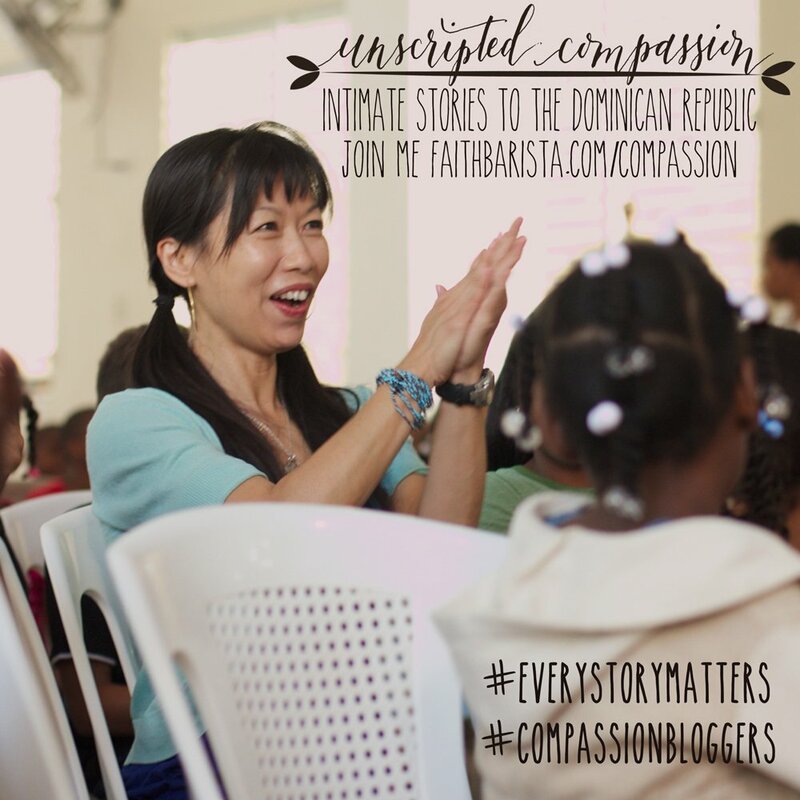 Share with friends and your small group! Do you know a friend who would love some rest and refreshment? Share this blog post with her. She can sign up for the newsletter here. And you can read Whispers of Rest together! 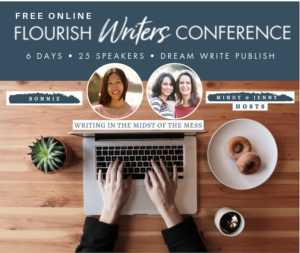 Let’s gather as many women to enjoy this journey! Read Today’s Lent Reflection: LOVE is a Journey || Whispers of Rest Lent Begins!